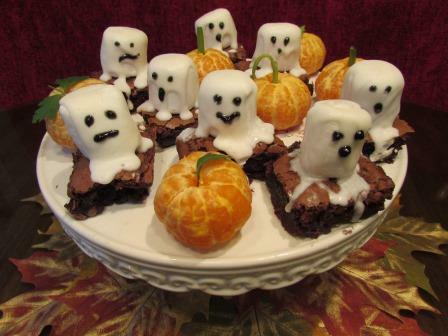 Spooky Boo Ghost Brownies are a fun edition to any Halloween get together! Who doesn’t love brownies?!? So why not have some fun with this classic favorite and add a touch of boo this Halloween. If you don’t have a lot of time and want to limit the sweet treats you are making for the pre-trick-or-treating adventure, this is a perfect homemade Halloween treat to inspire all the little witches and goblins! Or take to a Halloween get together to liven up the party. This is a Betty Crocker original recipe that is both spooktacular fun and delectable eating. So gather your supplies and lets start baking this homemade Halloween treat! 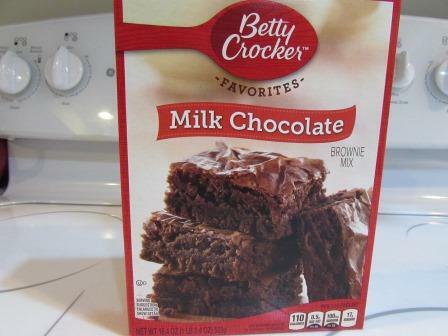 Pre-heat oven and combine brownie mix per instructions on the box. Line 8- or 9-inch square pan with foil so foil extends about 2 inches over sides of pan. Spray foil with cooking spray. Make brownies as directed on box for 8- or 9-inch square pan. Cool completely, about 30-45 minutes. Remove from pan by lifting foil; peel foil away. For brownies, cut into 4 rows by 4 rows. Heat frosting in microwavable bowl uncovered on High 30 seconds, stirring every 10 seconds, until frosting can be stirred smooth and fluid. Do not overheat or it will become to runny!. If frosting becomes too firm while decorating, microwave 5 seconds; stir. 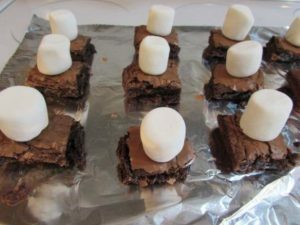 Top each brownie with 1 large marshmallow. Spoon 1 tablespoon frosting over each marshmallow to coat. Let stand until frosting is set, about 30 minutes. Use black gel to make eyes and mouths. Personal tip: place the tub of gel in the freezer about 5 minutes before using. This keeps the gel from running down the face of the ghost.